Bombardier Commercial Aircraft announced today that Arik Air of Nigeria has placed the first dual-class CRJ1000 NextGen aircraft configured with three-abreast business-class seating into service in West Africa. 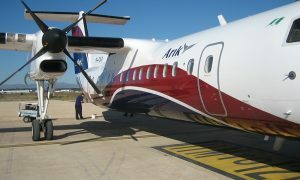 Arik Air will use the CRJ1000 NextGen aircraft to increase network service on its most popular business routes in West Africa. “Configured to offer the very best in-flight comfort and style for our passengers with 10 premier, three-abreast, business-class seats and 81 economy-class seats, theCRJ1000 NextGen aircraft also provides a high degree of operational flexibility to enhance our service, with a reduced environmental footprint to promote greener, more sustainable aviation,” said Dr. Michael Arumemi-Ikhide, Group Chief Executive Officer, Arik Air. “Designed to meet the needs of airlines in high-frequency regional markets, the CRJ1000 NextGen aircraft has established a reputation for excellent passenger comfort, while delivering outstanding fuel economy and up to 10 per cent cash operating cost advantage,’’ said Mike Arcamone, President, Bombardier Commercial Aircraft.